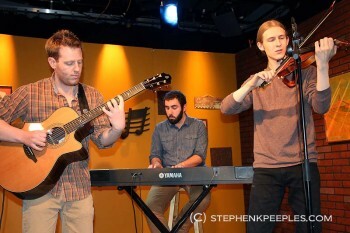 Progressive instrumental trio Woodwork makes its TV debut carving a set of four new original songs on an all-new edition of SCVTV’s “House Blend” series, hosted by Santa Clarita journalist Stephen K. Peeples and premiering Saturday, June 14, at 10 p.m. (Pacific). Featuring violin-fiddle player Avery Merritt, 18, acoustic guitarist Rory Glenn, 23, and keyboardist Brendan Coyle, 21, Woodwork creates a musically adventurous and still-evolving hybrid of jazz, progressive rock, classical, blues and Americana. 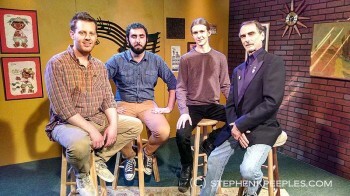 While this edition of “House Blend” marks Woodwork’s television debut, Avery guested in Season 1 in a jazzy duet with fiddle-violin legend and mentor Phil Salazar. Woodwork began to take shape a couple years ago in the music rooms at College of the Canyons’ Valencia campus. Merritt and Glenn met in one of their music classes and started jamming and writing together in and outside of class, and performed a few live shows as a duo. Encouraged by early fans to fill out their sound, Merritt and Glenn asked fellow music major Coyle to join as keyboardist in 2013. They christened the band Woodwork, and headed to the woodshed to compose and rehearse. Since then, they’ve performed a few select gigs while they worked on recording tracks for their first album. All three Woodworkers are virtuosic musicians with years of individual instruction, practice and live performance already behind them. But the young musicians’ chemistry and mutual respect as collaborators bring out a fresh, new multi-genre sound that goes beyond its individual elements. Woodwork has no vocalist, and by design. “None of us can sing, so we let the music do the talking,” Merritt said. He just earned his music AA at COC. For graduation, he affixed sheet music from John Coltrane’s “Giant Steps” to his mortarboard. Merritt will attend the Berklee School of Music in the fall. Find out more about Woodwork on the trio’s official Facebook page. Time-Warner Channel 20 in Southern California’s Santa Clarita Valley and AT&T U-Verse 99 in L.A.-Orange counties telecast the “House Blend” series, a presentation of SCVTV, community television for the SCV. SCVTV’s “House Blend” also streams live at the same time at www.scvtv.com. Award-winning Santa Clarita journalist Stephen K. Peeples books, researches, writes and hosts “House Blend,” one of SCVTV’s most-watched series. Peeples and SCVTV studio director Megan Perez co-produce “House Blend” at the SCVTV Media Center in Newhall, Calif. Perez also directs the show and the production staff, usually assisted by renowned TV sound engineer Mike Mazzetti. SCVTV President/CEO Leon Worden is “House Blend” executive producer. The “House Blend” series premiered on SCVTV in September 2010. The shows air and stream Saturday nights at 10 (PT) with an encore telecast/stream Thursday nights at 10. “House Blend” is now wrapping up its fourth season, with Woodwork starring in the penultimate show. 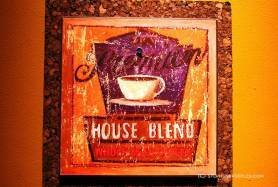 All “House Blend” shows produced to date – more than 40 original editions with music and interviews and a dozen all-music best-of compilations – are archived and viewable on demand. A series highlight was the May 2011 show featuring renowned folk-country-bluegrass duo Chris Hillman and Herb Pedersen, one of the top finalists for a WAVE award from the Western Alliance for Community Media. Read more here. For booking, sponsorship and more info about SCVTV’s “House Blend” with Stephen K. Peeples, email houseblend@scvtv.com. Santa Clarita journalist Stephen K. Peeples is a features writer and photographer for KHTS Radio News (hometownstation.com) and SCVTV’s SCVNews.com. He also writes the occasional post for his own website and independently provides Web editorial and social media services for select clients. On TV, Peeples is host, writer and co-producer of the popular “House Blend” music and interview show on SCVTV, community television for the Santa Clarita Valley (scvhouseblend.com). In addition, he delivers the KHTS/SCVTV “SCV Entertainment Beat” report Thursday night during SCVTV’s NewsBreak program. Peeples was the original award-winning writer/producer of “The Lost Lennon Tapes” radio series for Westwood One (1988-1990) and a 1994 Grammy nominee as co-producer of the “Monterey International Pop Festival” boxed set (MIPF/Rhino, 1992). Contact him at skp (at) stephenkpeeples.com or visit http://www.stephenkpeeples.com.